My friend and work colleague Melinda is a fabulous cook. Not that I’ve tasted anything that she’s prepared, but we do exchange recipes. 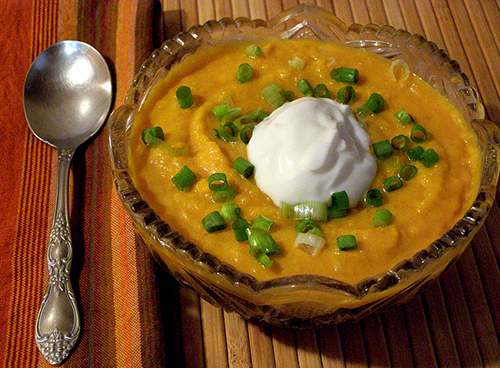 After enjoying her amazing Moroccan Butternut Soup, I was excited to try her pumpkin soup. 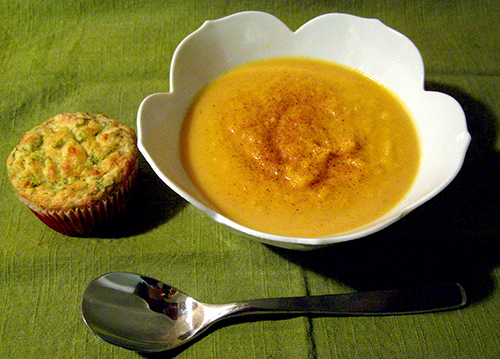 One key to its deliciousness is, like Zach’s Butternut Sage Soup, the squash (pumpkin) is roasted rather than boiled. Celery and onion provide classic aromatic flavors, and a touch of tomato paste zests up the soup in a unique way. Half and half adds creaminess. Finally, a touch of honey, salt, and pepper, to enhance the flavor of your particular pumpkin. If you picked up some sugar pie or other culinary pumpkins for Halloween decorations, now is a great time to cook them up. You can double this recipe to have plenty of soup for a gathering or potluck, or to have leftovers for your family during what’s bound to be a busy holiday season. Enjoy! 1 medium-small cooking pumpkin, ~2½ lbs. Halve the pumpkin and cut seed membranes with scissors. Scoop out with a spoon—a grapefruit spoon works well. Place cut-side up on baking sheet. Brush lightly with olive oil. Bake at 350 degrees for about 1 hour, till fork pierces easily. 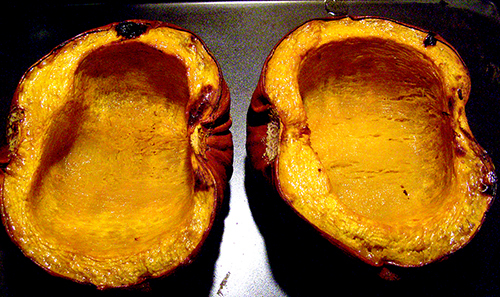 Remove from oven and brush any liquid that has accumulated inside the halves over all of the pumpkin flesh to avoid a hard skin. Set aside and cool. Melt butter in a large soup pot. Add onion and celery and sauté over medium heat till soft but not brown, about 10 – 12 minutes. While onion and celery are cooking, scoop pumpkin from shell and measure out 4 cups for the soup. 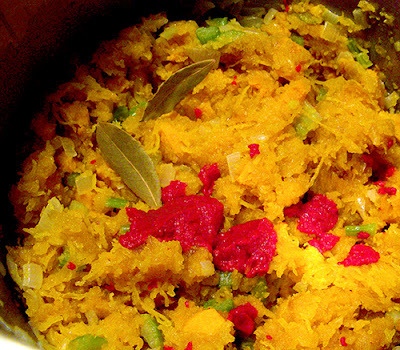 If you’re a little short, steamed butternut squash or even canned pumpkincan be used to fill in the gap. Add tomato paste, bay leaves, pumpkin, and broth. Bring to boil. Reduce heat to low and simmer for 30 minutes, checking every 10 minutes or so to ensure that there is enough liquid. Add more broth or water if needed. Remove from heat. Remove bay leaves. 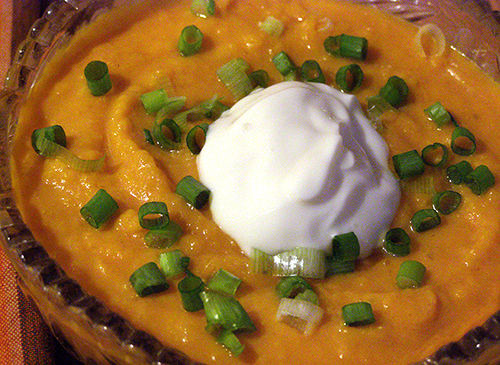 Puree soup to your liking with immersion blender. Add half and half. Return soup to low heat and simmer for about 5 more minutes. Stir in salt, pepper, and honey to your taste. Serve garnished with a dust of nutmeg, a dollop of sour cream or yogurt, and/or a sprinkling of chopped green onions. Where's the recipe for Parmesan herb muffins? Sorry, Ursula, but the muffin recipe isn't quite tweaked for prime time yet. Notice that they are pretty FLAT. We'll keep working on 'em!